BogaGrip by Eastaboga: Fly Fishing Gear - Burleson Sporting Co. 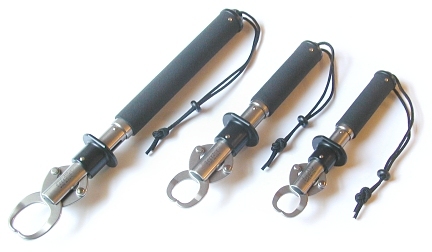 The BogaGrip handles, weighs, and keeps toothy fish at a safe distance. Durable non-rusting stainless steel construction is almost indestructible. 15, 30 and 60 pound models are in stock and ready to ship. The 30 and 60 pound BogaGrip scales are graduated in ½ pound increments. The 15 pound BogaGrip scale is graduated in ¼ pound increments. Robbie Shaw, one of our customers, using a BogaGrip on a 29" 9½lb. Redfish that he caught in Savannnah, GA on an 8 weight fly rod. Fletcher Tally, son of one of our customers, holding his 9½lb. Bass with the BogaGrip. Andy Rockwell, one of our customers, holding his 22lb. Peacock Bass with the BogaGrip. .
Carlos Heinsohn, one of our customers, making good use of the BogaGrip on upper Tomo river, Bogota, Colombia.